Horace moved from Worksop to Sheffield as a small boy and, along with his two older brothers, was keen to join up and do his bit during WW1. At the time of enlistment into the RFC on 5 Dec 1917 he lived on Murray Road, Eccleshall, Sheffield. He began training as a flight cadet, passing out of 2 Officer Technical Training Wing, 2 Officer Cadet Wing, then RNAS Eastchurch for armament and gunnery training. On 2 Aug 1918 he joined the British Expeditionary Force as a qualified observer on the massive Handley Page 0/400 bomber. Based chiefly at Roville-aux-Chenes airfield in France, the Independent Air Force was the forerunner of bomber command and many of the techniques learned at this time proved invaluable during WW2. Due to its lack of manoeuvrability and sheer size, the 0/400 was used chiefly at night and this, along with the awful weather, the bitter cold and enemy air defences proved treacherous. Additionally, mechanical reliability was poor and many aircraft were damaged on landing at night on an undulating grass strip (not necessarily the intended destination). 115 sqn then moved to Deauville at cessation of hostilities before returning to England. Horace was demobbed at Sheffield Hospital on 1 May 1919. Born Worksop 17/111899. Died Haslingden Hospital, Lancashire 22/12/1959. 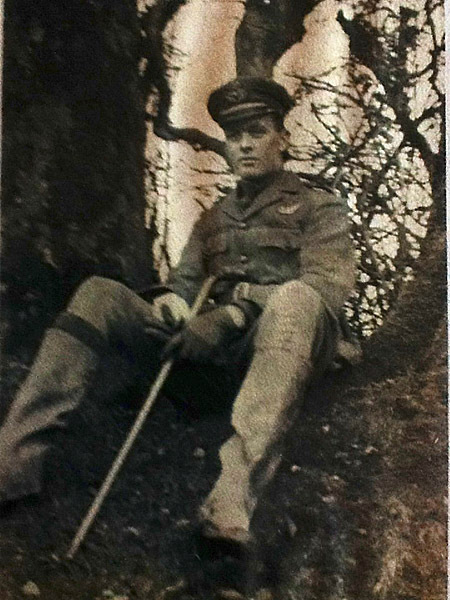 Lieutenant RFC, then RAF, # 110549 115 Squadron, Independent Air Force, RFC. Brother to Edward Albert Cahill, MM # 12/1277 York & Lancs and also to Frederick Cahill who also served.